Mater’ium is an extension of a sculptural body of work I starting in 2012 while studying the human cognitive experience of curved lines at Yale University in pursuit of a Computing and the Arts degree. Following a course in computational vision and biological perception that touched on numerous theories of neural activity in relation to our visual surroundings, I began crafting spatial visualizations of two-dimensional line drawings using carbon steel and an algorithmic treatment of tangent line orientations to raise these drawings from the canvas plane into three-dimensional space. Through the product that my artistic process creates, observers experience line in new and insightful ways. I have created a particularly eclectic set of sculptures in various mediums and from many different linear basis for display at the Umbrella Gallery. Some works are freestanding, while others continue the utilization of a plane canvas mounting structure to discuss spatial experience while exploring both mindless and highly directed yet physically abstracted linear drawings such as handwritten lettering, memorial sketches and subconscious doodled textures. Umbrella Gallery is proud to present Jennifer Wester’s solo exhibition “Mater’ium”, with an opening reception on March 12 from 6-9pm. Wester was raised in the Dallas-Ft.Worth Metroplex until 15 years old when she moved to Italy to train as an international figure skating competitor for the United States of America. From 2005-2010, she competed around the world as a member of Team USA in Ice Dance. Following a career as a professional figure skater, she entered Yale as an Eli Whitney Scholar with a focus on technology and art. After a course in Computational Vision and Biological Perception, the concept of x,y,theta spacial visualizations of 2D lines became an ever present idea in her work. In conjunction, she took up metal sculpture in order to realize those visualizations. In 2015, she graduated from Yale University with a Bachelor of the Arts in Computing and the Arts. In the summer of 2015, she studied welding with professional metal workers at Prentex Fabricators Inc. in Sunnyvale, Texas, and in 2016, transitioned fully to Dallas, TX from Connecticut to dedicate her time to sculpture. Artist Statement “Mater’ium” is an extension of a sculptural body of work I started in 2012 while studying the human cognitive experience of curved lines at Yale University in pursuit of a Computing and the Arts degree. Following a course in computational vision and biological perception that touched on numerous theories of neural activity in relation to our visual surroundings, I began crafting spatial visualizations of two-dimensional line drawings using carbon steel and an algorithmic treatment of tangent line orientations to raise these drawings from the canvas plane into three-dimensional space. Through the product that my artistic process creates, observers experience line in new and insightful ways. I have created a particularly eclectic set of sculptures in various mediums and from many different linear basis for display at the Umbrella Gallery. 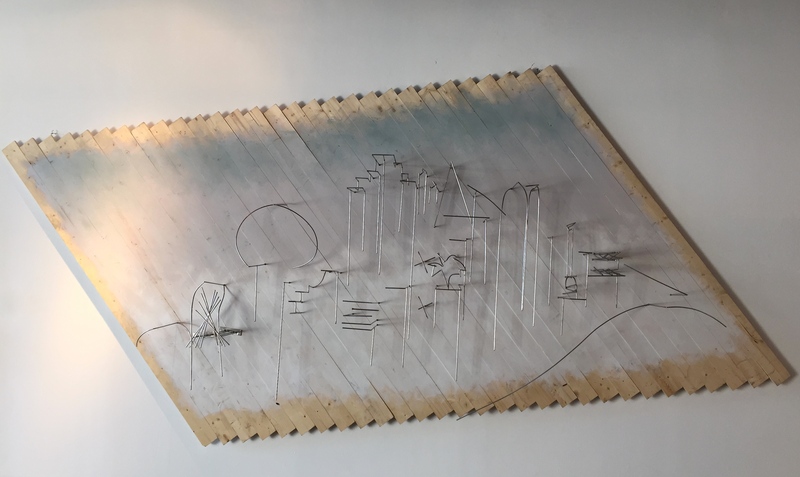 Some works are freestanding, while others continue the utilization of a plane canvas mounting structure to discuss spatial experience while exploring both mindless and highly directed yet physically abstracted linear drawings such as handwritten lettering, memorial sketches and subconscious doodled textures.